Dr. Douglas Steinbrech specializes in Kybella treatment for his male patients in NYC. He is proud to offer the newly FDA approved, a non-surgical injectable treatment to eliminate double chin fat with Kybella. The procedure is available in his office in New York and takes about 15 minutes with no downtime. To request your consultation to treat double chin for men in NYC with Kybella, please use the contact form or call (646) 480-7750. Our office is conveniently located near 60 E 56th St, New York, NY 10022. Kybella, also known as deoxycholic acid, is available in a non-invasive injectable procedure for adults who have moderate-to-severe fat deposits below the chin area. This type of fat is known as submental fat. Dr. Steinbrech is now able to treat his NYC male patients with Kybella and eliminate double chins without surgery. The whole process which takes 15 minutes is administered by Dr. Steinbrech with 10-20 injections of Kybella directly into the double chin fat area. The patient goes home the same day with minimal tenderness and mild to no scarring of any kind. The ideal candidate for the Kybella injection procedure would be males who have extra skin under the chin area. Kybella patients will lose the fat cells that are filling up the excess skin under the chin. Once the fat is dissolved, the ideal skin would be extremely elastic and resilient, allowing it to shrink appropriately after the procedure. Kybella is the only minimally invasive treatment available today to treat a double chin. Double chins tend to be highly resistant to diet and exercise, and therefore cannot be treated through self-help methods. Kybella is permanent and will not need to be repeated again in the future. 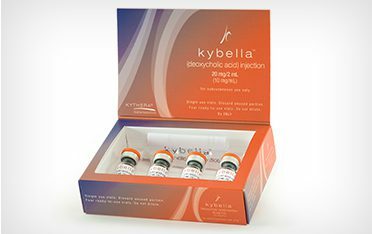 Kybella contains a synthetic form of the ingredient known as deoxycholic acid which is a natural molecule in the body that works to eat away dietary fat. When the substance is injected into the fat underneath the chin, the reaction absorbs and terminates the existing cells, leaving patients with noticeable results and a reduction in fullness of the treated area. Once treated, the existing cells can no longer retain fat. When patients have reached their desired results, no further treatment is required or necessary. Kybella can be injected to treat the excess tissue or pocket of fat located directly underneath the chin region. The number of Kybella injections each male patient needs is determined by the amount of excess fat that is under the chin, in addition to your desired results. The treatment process is quick and effortless and is typically completed within a 15-20 minutes. A certified specialist is the only individual that is authorized to administer the treatment. At each session, Dr. Steinbrech and his trained staff specialists will make multiple, small injections throughout the selected area. Submental fullness is characterized by the formulation of excess fat under the chin that is commonly referred to as the “double chin”. This can be a result of genetics, poor dietary and health habits, or age. Once you have received your Kybella injection treatment, you may resume regular day-to-day activities. NYC male patients typically have bruising, swelling or a sensation of numbness on or around the treated area. However, this is nothing to be concerned about unless these effects persist. There is no necessary or required downtime or recovery period. Each Kybella treatment is customized to your personal needs and desired results. Based on your chin profile, you will be treated with multiple, small injections throughout the chin area. Patients may receive up to six sessions but must be spaced out at least 1 month apart. Many patients have reported seeing visible results within 2-4 Kybella treatments. These side effects are temporary and will clear up on their own. It is important to contact your technician or primary health-care professional if you have difficulty swallowing, facial/muscle weakness, or you develop an uneven smile. Once Kybella is injected into the fat underneath the chin, the fat cells are destroyed. This means that the existing cells can no longer accumulate fat. Once you have reached your desired results, there is no need for follow up visits. Results are long-lasting to permanent and will depend on each male patient. If you’re ready to be free of the fat underneath your chin, contact Dr. Douglas Steinbrech today. Schedule your consultation at our NYC office to determine if Kybella could be helpful for you and your appearance. Call us today at (646) 480-7750 to speak to our Patient Coordinator to learn more.